When Larry first got started investing in real estate he had nothing to his name and had to learn everything in the school of hard knocks. 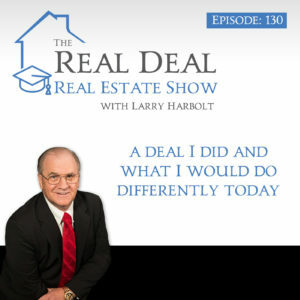 Hear the tale of one of Larry’s first deals and how he purchased a property without having any money. It was Larry’s first exposure to creative financing, he figured out what they wanted and found a way to give it to them. When putting together the terms, Larry only knew that he had a deal on his hands, not whether or not he had a good deal. That’s why it’s extremely important to know what numbers matter to the deal before you sign anything. Just because you can buy a property at a “good” price, that doesn’t mean you’ve got a good deal on your hands. One of Larry’s biggest mistakes he’s made and sees other people making is doing their own rehabs. Instead of doing all the repairs yourself, you should negotiate the price so that you can afford to hire a contractor. Remember, your time is worth something. Don’t just throw it away. You don’t make money swinging a hammer to save $12 an hour. Take a licensed contractor with you through the property before you make an offer. Too many people throw dollars at deals and fail to factor in holding costs to their deals. Things like the mortgage payment every month, the property taxes each month, property insurance each month, and other monthly fees. If you don’t factor those into your buying decision, they are going to come out of your profit check at the end. It’s going to take at least 4 to 6 months to rehab a property, don’t fool yourself.